Well, now we know who to ask what GE’s new Seaport office will look like: Doug Gensler. GE said in a statement that it “asked important and challenging questions about employee inspiration and teaming, environmental sustainability, and integration into the Boston innovation ecosystem” when considering architects. 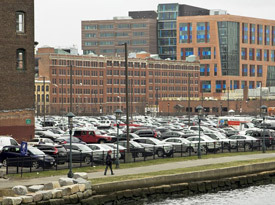 The headquarters must have a global scale and feel, GE said, while still remaining rooted in Boston.